Some nice spring/chinook salmon still being caught in Sooke! This report from a few days ago from James aka "drilleryells": "Went out for a Solo fish at 2pm, decided to go out front and was rewarded at Possession Point with the biggest fish of the year, 37Lbs. White Male , 60 Ft. off the Rigger in 70ft of water. Soft hit just a dip of the Rod and it was off. Had a Sealion chasing it and had to chase with the Kicker on high (why do I get all the biggest fish when I am by myself?). It hit a Purple Chrome head and a Betsey Flasher. Get out there they wont be here long.......Good Day Driller". Also, reports coming in of lots and lots of coho off Otter Point, double header after double header. A mix of wild and hatchery fin-clipped, which means "get the BBQ heated up". 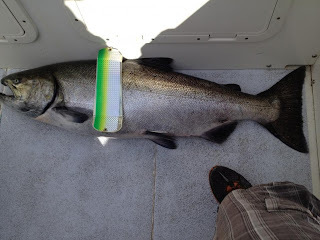 On another note, Dan posted up some videos of shore fishing from East Sooke, with a buzz bomb, catching coho. That's how the other half lives, catching salmon when you don't have a boat....great job! 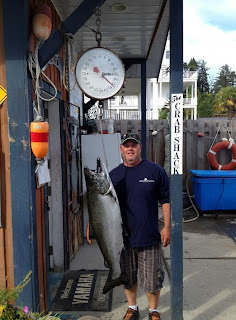 Hot sunny weather is the call this week....get yourself some Sooke salmon before the Fall monsoons hit!